Is there a better alternative to 321Soft Image Converter? Is 321Soft Image Converter really the best app in Photography category? Will 321Soft Image Converter work good on macOS 10.13.4? 321Soft Image Converter is the fastest and simplest way to convert between various image formats. It allows you to convert a variety of source image formats to most popular image formats, such as PDF, GIF, PNG, JPEG, JPG 2000, TIFF, BMP, TGA and PSD. 321Soft Image Converter can convert not only common images formats like PNG, JPG, GIF, TIFF, BMP, PDF, ICNS, ICO, but also perform RAW image conversion - converting RAW files ( .NEF, .CR2, .ARW, .SR2, .PEF, .ORF, .DNG, .RAW ) produced by digital cameras into JPG, PNG, TIFF, PDF, or other image formats. Version 3.3.3.17: Release notes were unavailable when this listing was updated. 321Soft Image Converter needs a review. Be the first to review this app and get the discussion started! 321Soft Image Converter needs a rating. Be the first to rate this app and get the discussion started! Perfectly convert image formats to a specified format from different source formats. 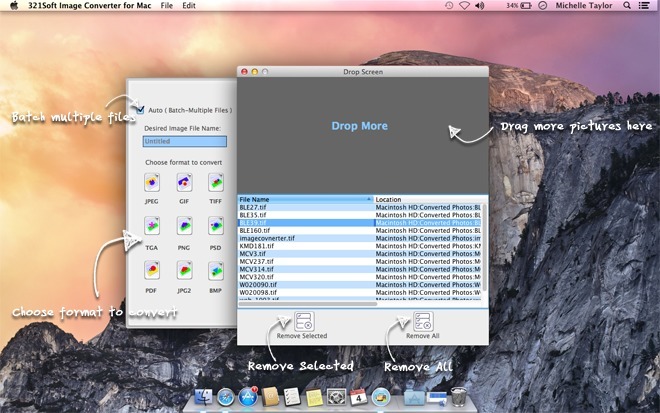 Just 2 simple clicks to batch convert image files. drag and drop picture(s) to the window. Then click on the destination image format. No complicated settings.